It's the first piece of furniture in any home. There's nothing as warm and welcoming as a crackling fire in an open fireplace. The dancing flames can lift your spirits and melt away the most stressful day in a matter of minutes. But to truly be part of the home, a fireplace must warm our hearts even when there is no fire in the grate. Pearl does not treat the mantel as trim or molding but as a beautiful piece of furniture that is the focal point of the entire room, the emotional core. It represents roots, heritage and tradition. Furniture is arranged around it, precious treasures are displayed on it, and it provides balance and stability to the entire room. Look for the pearl inlay that graces the right hand side of the shelf as proof that you have received an authentic Pearl Mantel. Wood is considered a combustible material. Heat clearances must be adhered to. If installing over a fireplace, check your local building codes and the manufacturer's instructions for your specific fireplace insert or stove. What is this material? This product is made from Wood. 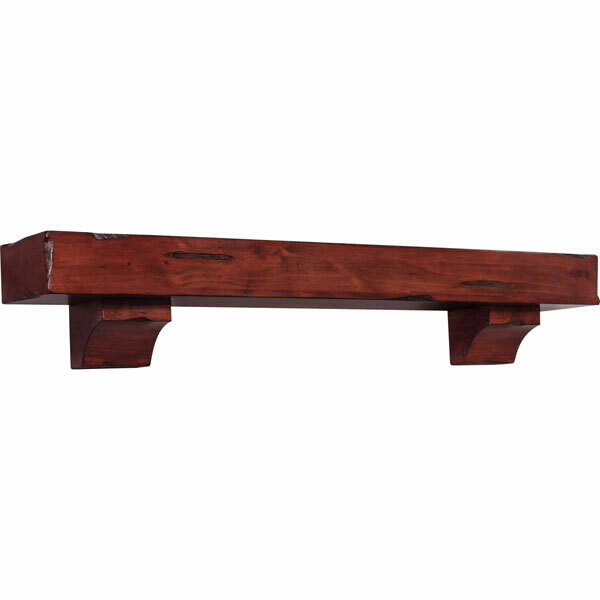 Pearl Mantels features fine furniture quality, stunning details and classic designs that will enhance any decor. The Shenandoah has a charming frontier flavor that will add a rustic decorative touch to your room. Hand-hewn edges and distressing enhance the natural beauty of the wood grain. The ample nine inch shelf depth allows plenty of display room. This pine shelf is paint and stain grade and may be hung with or without the corbels, which are packed separately in the box. Use in the bedroom, bathroom, kitchen, den or anywhere you need a little something extra for storage or treasures. Its uses are only limited by your imagination. Mitered hanger boards are included for ease of hanging. Look for the pearl inlay that graces the right hand side of the shelf as proof that you have received an authentic Pearl Mantel. Your inlay is masked so that you may easily paint or stain around it. Simply remove the mask when done. Pearl Mantels features fine furniture quality, stunning details and classic designs that will enhance any decor. Also available finished.